قربانی, مریم, حسین زاده, سروه. (1394). اثر تیمار گرمایی با روغن خام پنبه‌دانه (OHT) بر مقاومت به پوسیدگی و ثبات ابعاد راش ایرانی (Fagus orientalis). مجله صنایع چوب و کاغذ ایران, 6(1), 119-131. مریم قربانی; سروه حسین زاده. "اثر تیمار گرمایی با روغن خام پنبه‌دانه (OHT) بر مقاومت به پوسیدگی و ثبات ابعاد راش ایرانی (Fagus orientalis)". مجله صنایع چوب و کاغذ ایران, 6, 1, 1394, 119-131. قربانی, مریم, حسین زاده, سروه. (1394). 'اثر تیمار گرمایی با روغن خام پنبه‌دانه (OHT) بر مقاومت به پوسیدگی و ثبات ابعاد راش ایرانی (Fagus orientalis)', مجله صنایع چوب و کاغذ ایران, 6(1), pp. 119-131. قربانی, مریم, حسین زاده, سروه. اثر تیمار گرمایی با روغن خام پنبه‌دانه (OHT) بر مقاومت به پوسیدگی و ثبات ابعاد راش ایرانی (Fagus orientalis). مجله صنایع چوب و کاغذ ایران, 1394; 6(1): 119-131. این تحقیق به منظوربررسی اثرتیمار گرمایی باروغن خام پنبه‌دانه بر ویژگی‌های فیزیکی و مقاومت به پوسیدگی چوب راش ایرانی به ترتیب براساس استانداردهای ASTM-D1037 و EN113 انجام شد. تیمار گرمایی در سیلندر با استفاده از روغن خام پنبه-دانه تحت دماهای 130 و 170 درجه سانتی‌گراد و در زمان 30 و 60 دقیقه انجام‌گرفت. جذب روغن، وزن مخصوص، واکشیدگی حجمی،جذب آب وکاهش وزن متعاقب پوسیدگی اندازه‌گیری شد. جذب روغن در 30 و 60 دقیقه به ترتیب 5/10 و 3/13 کیلوگرم‌برمترمکعب برآورد شد. بیشترین دانسیته مربوط به نمونه‌های تیمار روغنی-گرمایی بود که در پایین‌ترین زمان و دمای تیمار نسبت به نمونه شاهد 7/87 درصد افزایش یافت. براساس نتایج، تیمار روغنی-گرمایی، آب‌گریزی و ثبات ابعاد نمونه‌ها را افزایش داد به طوری‌که جذب آب تحت دمای 130 درجه سانتی‌گراد و زمان 60 دقیقه در مقایسه با شاهد،0/76 درصد کاهش نشان داد. مقاومت نمونه‌های غوطه‌ور در روغن به‌مدت 60 دقیقه در برابر قارچ پوسیدگی سفیدرنگین کمان (Trametes versicolor)، 2/80 درصد بیش از سطح شاهد برآورد شد. تیمار روغنی-گرمایی در مقایسه با روغن، به بهبود مقاومت در برابر پوسیدگی منتهی شد که این اثر در زمان 30 دقیقه معنی‌دار بوده‌است.در مقایسه دو سطح زمانی، با افزایش دما در اصلاح روغنی-گرمایی طی زمان 30 دقیقه، مقاومت به پوسیدگی بهبود معنی‌دار یافت، ولیکن این بهبود تحت دمای یکسان با افزایش زمان، معنی‌دار نبود. Olsson, T., Megnis, M., Varna, J. and Lindberg, H., 2001. Measurement of the uptake of linseed oil in pine by the use of an X-ray micro densitometry technique. Wood Science, 47(4): 275-281. Holfand, A. and Tjeerdsma, B.F., 2005. Wood protection by chemical modification. ECOTAN 3rd Report, Part 3. Boonstra, M.J., Tjeerdsma, B.F. and Groeneveld, H.A.C., 1998. Thermal modification of non-durable wood species 1. The PLATO technology, thermal modification of wood. The International Research Group on Wood Preservation. IRG Document No. IRG/WP 98-40123. Tjeerdsma, B.F. and Militz, H., 2005. Chemical changes in hydrothermal treated wood: FTIRanalysis of combined hydro thermal and dry heat-treated wood. Holz als Roh-und Werkstoff, 63(2): 102-111. Tjeerdsma, B., Boonstra, M., Pizzi, A., Tekely, P. and Militz, H., 1998. Characterisation of thermally modified wood: molecular reasons for wood performance improvement. Holz als Rohund Werkstoff, 56: 146- 153. Sailer, M., Rapp, A.O., Leithoiff, H. and Peek, R.D., 2000. Upgrading of wood by application of an oil-heat treatment. Holz als Roh-und Werkstoff, 58(1/2), 15-22. Nuopponen, M., 2005. FT-IR and UV Raman spectroscopic studies on thermal modification of Scots pine wood and its extractible compounds, Academic Dissertation, Helsinki University of Technology, 40 p.
 Hietala, S., Maunu, S.L., Sundholm, F., Jamsa, S. and Viitaniemi, P., 2002. Structure of thermally modified wood studied by liquid state NMR measurements. Holzforschung, 56, 522-528. Hakkou, M., Ptrissans, M., Bakali, E.I., Gerardin, P. and Zoulalian, A., 2005. Wettability changes and mass loss during heat treatments of wood. Holzforschung, 59: 35-37. Kamdem, D.P., Pizzi, A. and Jermannaud, A., 2002. Durability of heat-treated wood. Holz als Roh- und Werkstoff, 60, 1-6. Mirshokraei, S.A., 2003. Wood chemistry. Aeeizh Press, 248 p. (In Persian). Hill, A.S.C., 2006. Wood Modification Chemical, Thermal and other processes, John Wiley and Sons Press, England, pp: 99-127. Rapp, A.O. and Sailer, M., 2001. Oil heat treatment of wood in Germany-State of the art. In: Review on heat treatments of wood. COST Action E22, Environmental optimisation of wood protection, Proceedings of the special seminar held in France, February 9, 2001, 45-62. Gunstone, F.D., 2002. Vegetable Oils in Food Technology: Composition, Properties, and Uses, Blackwell, Osney Mead, Oxford, CRC Press, Boca Raton. Wang J.Y. and Cooper P.A., 2005. Effect of oil type, temperature and time on moisture properties of hot oil- eated wood, Holz als Roh-und Werk stoff, 63: 417-422. Moralle-Rejesus, M.B., Maini, H.A., Hsawa, k. and Yamamoto, J., 1984. Insecticions of several plant to Callosbruchus chinenis Bruchids andlegumes. Economics, Ecology and Coevolution, 91-100. Bernays, E.A. and Chapman, R.F., 1998. Chemicals in plants in: Host-plantselection by phytophagous insects, Chapman, London, 309 p.
 Jamsa, S. and Viitaniemi, P., 2001. Heat treatment of wood. Better durability without chemicals. In: Proceedings of COST E22. Environmental Optimisation of Wood Protection, Proceedings of the special seminar held in France, 9 February 2001, 19-24. Welzbacher, C.R. and Rapp, A.O., 2002. Comparison of thermally modified wood originating from four industrial scale processes – durability. International Research Group Wood Preservation: Doc.No: IRG/WP 02-40229, 13 p.
 Yang, V.W. and Clausen, C.A., 2007. Antifungal effect of essential oils on southern yellow pine. Inter Biodeter Biodegr, 59: 302-306. Schwarz, F.W.M.R. and Navi, P., 2003. Investigation of factors that enhance the resistance of thermo-hydro-mechanically (THM) densified wood to colonization and degradation by wood decay fungi; Cost Action E37: Sustainability through New Technologies for Enhanced Wood Durability, Switzerland. September 2003. 11-19. European EN113., 1996. Wood preservatives, Test method for determining the protective effectiveness against wood destroying Basidiomycetes, Determination of the toxic values. American Society for Testing and Material (ASTM), D1037-06A. Test methods for evaluating properties of wood-base fiber and particle panel materials, West Conshohocken, Pennsylvania, 2006. Qanaei Tarzi, B., Hosseini, A. and Qavami, M., 2006. Check the fatty acid composition of different types of liquid vegetable oil in Iran. Journal of Food Science and Nutrition. 3(2):59-69. (In Persian). Spear, M.J., Fowler, P.A., Hill, C.A.S. and Elias, R.M., 2006. Assessment of the envelope effect of three hot oil treatments: Resistance to decay by Coniophora puteana and Postia placenta. The International Research Group on Wood Protection, IRG/WP 06-40, Pp: 209-216. Sanaei, A. and Mohebby, B., 2004. The effect water heat treatment on the physical properties of beach wood. Journal of Agricultural Sciences and Natural Resources of the Caspian. 2(2): 1-13. (In Persian). Alen, R., Kotilainen, R. and Zaman, A., 2002. Thermochemical behavior of Norway spruce (Picea Alba) at 180-225 °C. Wood Science and Technology, 36: 17-163. Homan, W., Tjeerdsma, B., Beckers, E. and Jorissen, A., 2004. Structural and other properties of modified wood. In: World Conference on Timber Engineering, British Columbia, Canada. Proceeding, British Columbia, Canada, 8 p.
 Stamm, A.J. and Baechler, R.H., 1960. Decay resistance and dimensional stability of five modified woods. Forest Products Journal, 10: 22-26. Syrjanen, T., 2001. Production and classification of heat treated wood in Finland. COST Action E22, Environmental optimisation of wood protection, Proceedings of the special seminar held in France, 9 February, 11-19. Hakan, M., 2008. Effect of heat treatment on Equilibrium Moisture Content (EMC) of some wood species in Turkey. Research Journal of Agriculture and Biological Sciences, 4(6): 660-665. Nuopponen, M., Vuorinen, T., Jamsa, S. and Viitaniemi, P., 2004. Thermal modifications in softwood studied by FT-IR and UV resonance Raman spectroscopies.Journal of Wood Chemistry and Technology, 24(1):13-26. Chehreh, F., Mastari Farahani, M.R. and Sadeghi Mahounak, A.R., 2012. Effect of rapeseed oil heat treatment using rapeseed oil on dimensional stability of Populus deltoides wood. 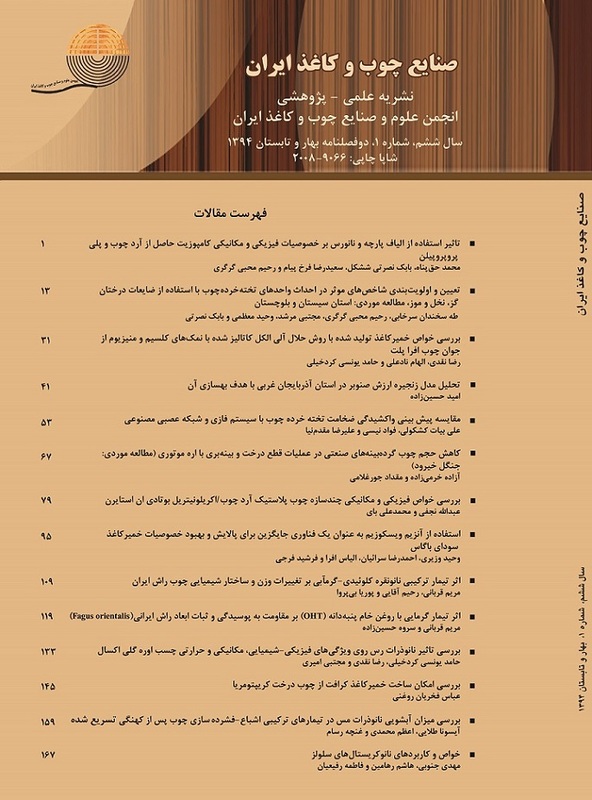 Journal of Wood & Forest Science and Technology, 19 (2): 105-117 (In Persian). Abdeh, M.R., Mootab Saei, A. and Mohebbi, B., 2010. Influences of Oleothermal Modification of Fir (Abies sp.) wood in Soy Oil on its Physical and Mechanical Properties. 3rd International Seminar on Oilseeds and Edible Oils. 1-10 (In Persian). Salim, R., Ashaari, Z. and Samsi, H.W., 2010. Effect of Oil Heat Treatment on Physical properties of Semantan Bamboo (Gigantochloa scortechinii Gamble). Modern Applied Science, 4(2): 107-113. Rezayati-Charani, P., Mohammadi-Rovshandeh, J., Mohebby, B. and Ramezani, O., 2007. Influence of hydrothermal treatment on the dimensional stability of beech wood. Caspian J. Environ. Sci. 5(2): 125-131. (In Persian). Aydemir, D., Gunduz, G., Altuntas, E., Ertas, M., Sahin, H.T. and Alma, M.H., 2011. Investigating changes in the chemical constituentsand dimensional Investigating changes in the chemical constituentsand dimensional. BioResources, 6(2): 1308-1321. Hyvonen, A., Piltonen, P., Nelo, M. and Niinimaki, J., 2005. Wood protection tomorrow-Potential of modified crude tall oil formulations in wood protection. In: Proceeding of the Seventh Finnish Conference of Environmental Science, May12-13, Jyvaskyla, Finnish Society for Environmental Sciences, University of Jyvaskyla: 35-38. Kartal, S.N., Hwang, J.W., Imamura, Y. and Sekine, Y., 2006. Effect of essential oil compounds and plant extracts on decay and termite resistance of wood. Holz als Roh- und Werkstoff, 64: 455-461. Wang J., 2007. Initiating Evaluation of Thermal-Oil Treatment for Post-MPB Lodgepole Pine. Forinte Canada Corp. Western Division 2665 East Mall Vancouver, British Columbia V6T 1W5, 41 p.
 Karlsson, O., Sidorova, E. and Moren, T., 2011. Influence of heat transferring media on durability of thermally modified wood. BioResources, 6(1): 358-372. Banson, S. and Mehendra, R., 2008. Antifungal activity of essential oils from Indian medcinal plants against humain pathogenic Aspergillusfumigatus and Aspergillus niger. World Journal of Medical Sciences, 3: 81-88. Hakkou, M., Petrissans, M., Gerardin, P. and Zoulalian, A., 2006. Investigations of the reasons for fungal durability of heat-treated beech wood. Polymer Degradation and Stability, 91: 393-397. Kocaefe, D., Poncsak, S. and Boluk, Y., 2008. Effect of thermal treatment on the chemical composition and mechanical properties of birch and aspen. BioResources, 3(2): 517-37. Sivonen, H., Maunu, S.L., Sundholm, F., Jämsä, S. and Viitaniemi, P., 2002. Magnetic resonance studies of thermally modified wood. Holzforschung, 56(6): 648-654. Boonstra, M. and Tjeerdsma, B., 2006. Chemical analysis of heat treated softwoods. Holz als Roh- und werkstoff, 64: 204-211. Gonzalez-Pena, M.M., Curling, S.F. and Hale, M.D.C., 2009. On the effect of heat on the chemical composition and dimensions of thermally modified wood. Polymer Degradation and Stability, 94(12), 2184-2193.